The two cabins, donated by the Popma family, are each divided into 2 rooms. The Alturas/Boulder Cabin contains 3 beds each, accommodating 6 people. The Copper Basin/Eagle Mountain Cabin contains 4 beds each, accommodating 8 people. There is a private exterior entrance for each room as well as an interior door connecting the rooms to one another. The cabins are insulated with finished walls and include overhead lighting, electrical outlets, a small desk and lamp. 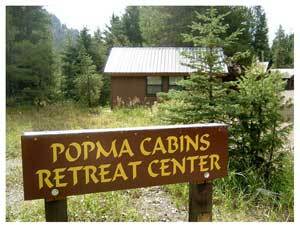 The Popma Cabins are located at the south end of camp near the Camper’s Cabins.